"When any of our creations is a crowd-pleaser, we make more and more of it. That’s the case with our Tyrwhitt Cool shirts, which we now deliver in our well-loved cotton poplin fabric. We’re even adding two new, warm weather-ready shades Aqua and Peach, which will launch wardrobe off on a marvellous direction this season." "Innovative Natural Cool technology - special 100% cotton fabric designed to keep you cool, dry and comfortable throughout the day. Non-iron finish keeps you looking crisp and smart"
Our spread collar is wider than the classic collar. The tips of each side of the collar point outwards (not down) so more of your tie is visible. Very nice deal (3 shirts for $99) to try the cooling fabric. Would've preferred a French cuff option. The fit and the fabric are what I've come to expect from Charles Tyrwhitt. I love it! As mentioned in my review the quality is bad. My white shirts attract a lot of lint and the shirt always looks messy. I am a 33/34 on my sleeves so I order a 34. When it arrived the shirt sleeves fit as if it were a 32. Too short. Response from Charles Tyrwhitt: It's always a great disappointment whenever we see a customer not thoroughly enjoying their purchase from us, but we appreciate you sharing your concerns following this first purchase. 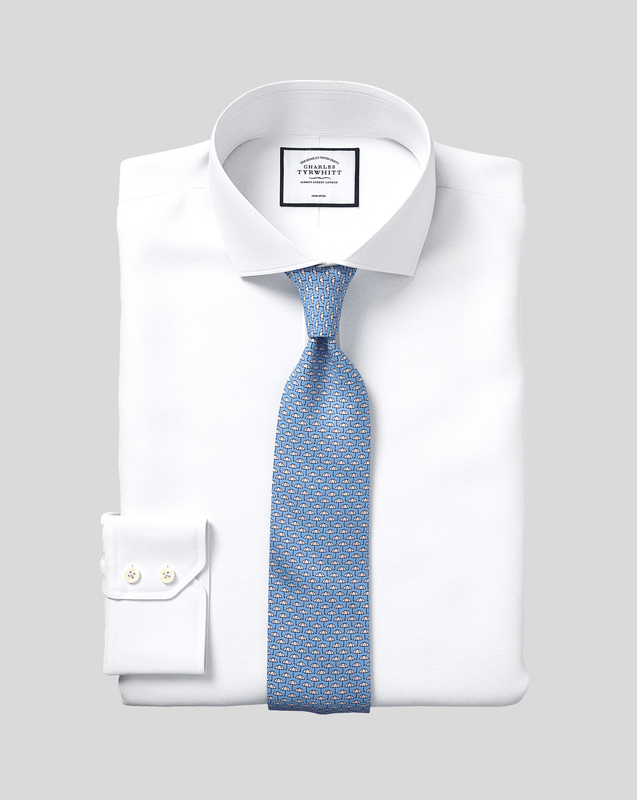 Rest assured that all purchases from Charles Tyrwhitt come with a no quibble 6-month guarantee, so we would welcome you to return these shirts to us for either an exchange or refund. Please access our online returns portal at www.ctshirts.com/rebound to get started and let us know you if you require any assistance. Delivery time could be better.